God designed men with generally bigger bodies and greater muscle mass. But he certainly didn’t leave women defenseless. Most women, along with their beauty, come equipped with a tongue that can cut like a stiletto. That oral fillet knife, coupled with an unhappy heart and mood swings, can do a lot of damage to a relationship. “Better to live in a desert than with a quarrelsome and ill-tempered wife,”Solomon wrote (Proverbs 21:19). “A quarrelsome wife is like a constant dripping” (Proverbs 19:13). Memo to wives: be careful of your tongue. Bitter words once set free can’t be sucked back down the throat. You have the power to use words to chop a man down, but you afterward might find that he doesn’t stand quite as tall anymore. Don’t nag either. You cannot change your husband. Only he can change himself, and if you make him feel small, he will resist you out of spite. If you persistently make him feel small, he will live down to your expectations. Build him up, and he may just grow up into your high praise. Just as Christ has treated you better than you deserve, soften that tongue and speak to your husband better than he deserves. Help Meet the Challenge Grant! A group of generous friends has stepped forward with a $350,000 Challenge Grant. This means any gift you give to Time of Grace this month will be worth twice as much to share the timeless truths of God’s Word with others! 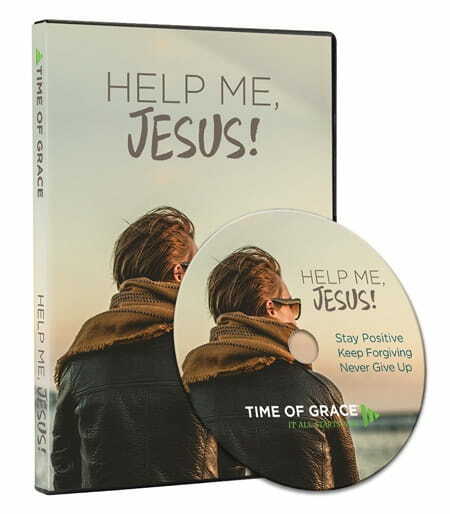 This three-part DVD focuses on looking to God when you’re struggling with issues like forgiving others and persevering through trials. And the prayer book helps you put your struggles and concerns into words—and turn them into prayers to God. The Help Me, Jesus! set is our thank-you for your donation to help us continue telling others of the forgiveness they have through Jesus. Request your copy today! For more from Time of Grace visit them at TimeofGrace.org or visit their OnePlace.com and LightSource.com pages!